According to the airline, the pilot in command, Captain D Ganesh Babu, has a flying experience on the B737 aircraft of 3,600 hours. TIRUCHIRAPALLI: The Dubai-bound Air India Express plane was flying at a speed of 250 km and possibly overloaded when its tyre hit an equipment used to guide a pilot to land a flight and then brushed the compound wall during take-off at the International Airport here early Friday, officials said. 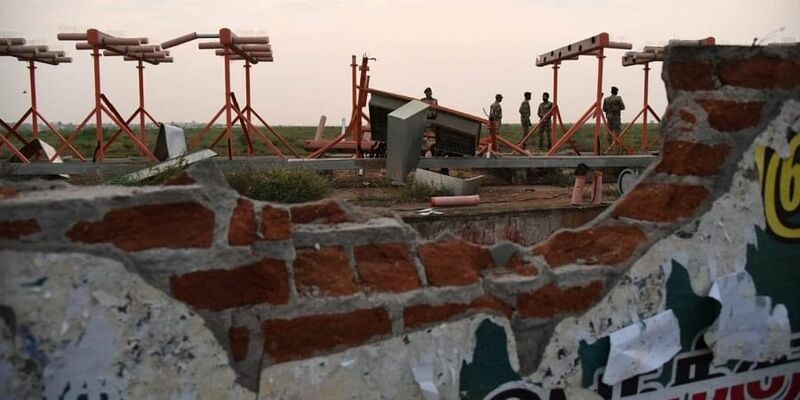 Tiruchirappalli airport Director K Gunasekaran has said on-duty Central Industrial Security Force (CISF) personnel had informed the air traffic control (ATC) about the accident, following which the air traffic controller informed the pilots about it. A day after all 136 people on board the Air India Express plane had a miraculous escape, airport officials Saturday said airport staff, including CISF personnel, who informed the ATC about the accident, are being questioned. The first officer, Captain Anurag, has an experience of about 3,000 hours on the B737. Ganesh Babu had reportedly told officials that there was no problem in the plane and all the cockpit equipment indicated to him that plane was in good shape, airport officials said. The officials said the pilot was supposed to take-off at a particular point on the '8169 runway,' but he could have crossed that point before taking off leading to the tyre brushing the wall. When the passengers asked about the "scary rocking" experienced by them, they were reportedly told by the crew that it was common. "It is not known when the ATC staff contacted the pilot after the incident. The exchange between the pilot and the ground staff, timing etc will be examined during the investigation," officials said. It was also possible that the plane was overloaded leading to the problem in taking off and reaching a particular height, they said. According to officials, a car passenger, who passed by that way at the same time, was injured as a piece of debris of the wall, which was damaged in the incident, hit her. This would also be investigated, they said. The passenger has been identified as Manimala of Tiruvarur district. A piece of fence mesh was seen trapped near the tyre of the plane and its bottom was found slashed in the impact, officials said. Gunasekaran has said after the air traffic controller informed the pilots about the accident, the pilots reported that "all operations normal. So we allowed them (to proceed)." Airport officials had Friday informed their counterparts in Dubai about the accident and told them that there was no major damage to the aircraft and it was safe for it to land there. However, Dubai airport officials refused to allow the plane (flight IX-611), which took off from Tiruchirappalli at 1. 30 am, to land under the presumption that it was risky to allow it as the tyre had been slightly damaged, throwing the passengers on board into another round of anxiety. The passengers were then told that the plane could land in Mumbai and the permission for it had been obtained. After four hours of flying, the plane landed in Mumbai airport at 5.45 AM. The passengers flew to Dubai by another aircraft. The pilots have been "derostered" pending investigation, Air India Express later said in a statement. Luckily escaped God bless them.